Originally trained as a bespoke tailor, James Todd changed gears in 2009 and has been actively involved in graphic and type design. Occasionally working for P22 Type Foundry and Hamilton Wood Type Foundry, he has released his original fonts under the name of James Todd Design. Garvis, which is also available as a webfont, shows his attention to detail. Here are some highlights from the EULA. Desktop use supports up to 5 computer at a single geographic location. You can create a secured non-editable PDF for non-commercial use. You may provide the use of the fonts to a third party working on your behalf only if they use the font exclusively for your work, agree to all terms of license, and retain no copies of the font when the work is completed. You cannot modify the font software without the express permission of the foundry. You cannot embed the font into a Website or Application. EULA highlights will be posted every other Monday. Next up is Typofonderie. Looking for new fonts? If you follow the FonShop blog, then you may have noticed that we mention new fonts every Tuesday. And since our team loves to create lists, we made the ultimate list of just new fonts. Bookmark the New Fonts page and keep updated on latest fonts that FontShop carries. Buyer’s Guide: Need A Quote? For many of the desktop fonts available, you can license up to 1,000 users for the fonts online. If you need to license more than 1,000 users for the fonts you’re interested, contact us and we can let you know the costs for larger Multi-User Licenses. Quotes are easily obtained once you’ve added the items you need to purchase to the cart. Desktop fonts are licensed in blocks of users; you will have to enter the number of computers that you will need to support, and the cart will automatically recalculate your subtotal if necessary. The default number of users is the cost of a basic license. Web licensing is based on the number of pageviews per month the website you’ll be using the fonts on generates. Pricing for webfonts are based in tiers of up to 500000 pageviews per month (pvm), 5 million pvm, or 50 million pvm. If your website is super popular and the traffic it generates is over 50 million pvm, let us know and we can provide quotes based on your needs. Be sure to double check the End User License Agreement before licensing font. End User License Agreements, EULAs for short, are rules to follow when you want to use a font. You’ll want to keep in mind that you are not purchasing the typeface itself, but a license to use the font software. Because we have 100+ foundries that have their own EULA and you might not want to read every single one, we added a shortcut to a product’s EULA at the bottom of their page. If your company is growing, you can always extend your license to support additional computers by contacting us. We’ll also answer any additional questions you may have before your purchase. If you’ve ever wanted to see just a few letters together in a font or how a short phrase looks in a certain typeface, you can use our Custom Sample Toolbar. If you see blank spots or empty squares in place of a letter or glyph, then that means that font does not contain that specific character. This is more likely to happen if you enter sample text in a different language, but we do have many fonts that have wide language support. If you need to compare how the text looks between certain fonts that aren’t right by each other in a list, you can Favorite the font and the font will be saved in your Favorites list with the sample text you originally previewed it in. You can also use the Custom Sample Toolbar to preview OpenType features of a font! And don’t forget: for the majority of fonts that we do have available on FontShop, we have a plug-in that allows people to play around and test fonts within Adobe Creative Suite CS5 or higher (Photoshop, Illustrator, and InDesign only) before buying — this is completely free and easy to download and use. We hope you enjoyed the typographic treat in your inbox this morning to kick off the second day of your new year. The FontShop team loves putting together this Best Type issue of our newsletter each year and 2012 was no exception. It’s always agonizing making the final list because we love so many of the fonts that make their way across our desk(tops) every 12 months. We try to showcase a variety of 2012 additions from our catalog, from runaway hits like FontFont’s FF Chartwell to brand spanking new releases like Monokrom’s Telefon. Planning for the issue begins about two months before we unleash it on the world. We bring together our Sales & Support Team, our Marketing Team, and of course our Design Team and Type Experts to bring their favorites and review the 2012 typefaces. As we brainstormed categories this year, we began joking about how it felt like putting together a yearbook. We ran with this and love the retro yearbook style our designers brought to the final product. Huge props always go to our amazing type experts, David Sudweeks and Yves Peters for creatively writing the issue based on our theme and categories. Who didn’t laugh at the line about Filmotype Kitten washing her hair? We truly hope you have as much fun reading this issue as we did making it. How excited are you for a whole NEW YEAR of fonts though? What releases are you most looking forward to this year? Buyer’s Guide: When and how will I get my fonts after I buy them? Depending how you plan on purchasing your font, you can receive them immediately via a Download link after completing your purchase or you can have them sent to you via email. 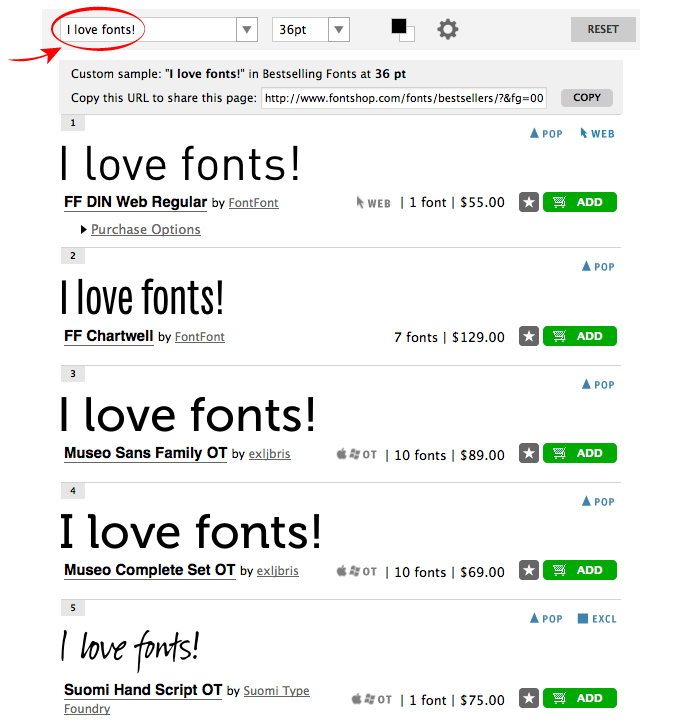 If you plan to purchase fonts online, create an account with your email address, add them to your cart and checkout. After you review your order, finish checking out, and have been notified that your purchase has been completed, you will have the ability to download them immediately! Click on the “Download” button and your download will automatically begin. If you accidentally closed your browser window before you clicked on the Download button, don’t fret! You can go into your account and access the fonts you bought. 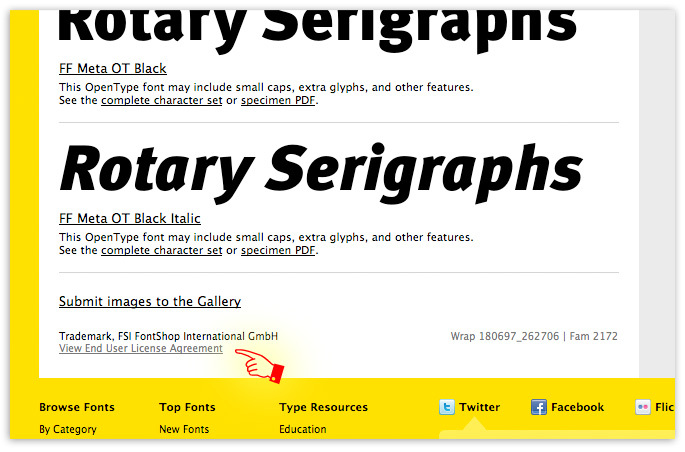 When you login on FontShop, there will be a link that says “My Account” in the upper right hand corner. You will be taken to your Account Overview page where you’ll be able to immediately see your Recent Order History. From here, you can click on the ID number for your most recent order and download your fonts from there. You can access your account at any time and view your entire order history, where you’ll be able to download fonts you have previously purchased — very handy in case your computer crashes or your font library gets wiped out! If you can’t access your account or order history for any reason, send us an email, and we’ll happy to look up your order and send you the fonts you bought via email. Whenever you purchase a font, we advise that you make a copy of the fonts for archival purposes; this will make the process of recovering your fonts much quicker and convenient since you’ll know exactly where you have your fonts archived. Buyer’s Guide: What is the FontShop Plugin? The FontShop Plugin lets you preview 150,000+ fonts in popular Adobe® Creative Suite® programs for free! We know you’ll fall in love with it. So download the free FontShop Plugin today and start tagging fonts to create preview layers!